When most people think of stripes, their mind first conjures up images of classic white and navy blue striped tees. The nautical feelings we associate with that print originated in the French coastal region of Brittany in 1858, when these striped shirts were introduced as a uniform for the French Navy. What we now know as the Brenton striped shirt, became famous when Coco Chanel became inspired by the sailors’ uniform, and created an entire nautical collection in 1917. The casual design helped to transform the image of womenswear at the time, from heavily corseted fashion into something more wearable. Recently we’ve noticed a lot of designers are experimenting with this this centuries old pattern, and giving it a new life. If you’re looking for a refined take on this pattern, Brunello Cucinelli has a few options this season. The scarves released for Brunello Cucinelli’s Spring / Summer 2019 collection are nothing short of elegant. Whether it’s beige toned stripes infused with golden threads or orange patterns accented by copper threads, these scarves can be combined with similar toned sweaters and jeans accented by stripes of monili beading at the cuffs. Péro have created multiple pieces in their Resort and Spring / Summer 2019 collections that feature striped patterns. From sandy colored patterns reminiscent of the beach, to blue stripes embellished with floral accents, Péro has a little bit of everything for those who appreciate feminine styles. Because the colors are on the soft side, it becomes easy to see how one could incorporate coats like these effortlessly into their daily wardrobe. Issey Miyake is no stranger to texture, as each of his pieces are pleated in some way. Therefore, it’s no surprise that he is continually experimenting with new fabric technology, as these sweaters are knit in such a way that gives them three dimensional stripes. For those who wish to indulge in an unconventional and tactile take on this trend, look no further. Gilda Midani strives to create clothes that are ultimately as artistic as they are comfortable. For Gilda’s Resort 2019 collection, she has experimented with textural stripes in variety of ways, from combining them with polka dots, to creating larger multi-colored prints. 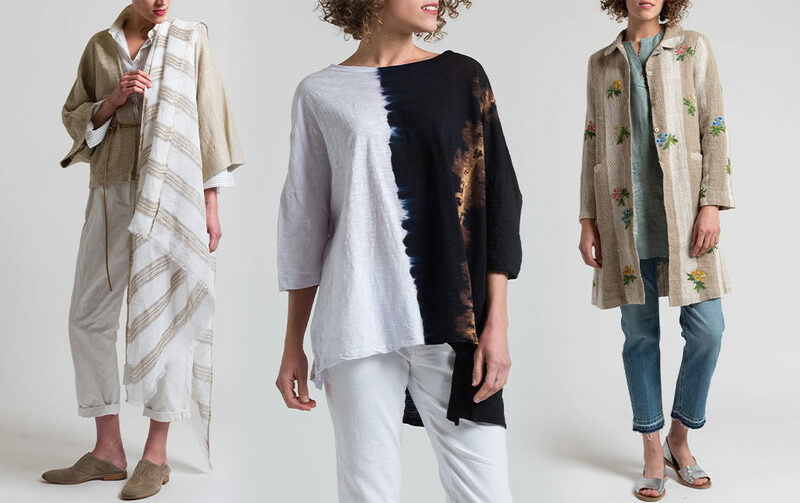 Each piece is beautifully colored using natural dyes, combined with asymmetrical hemlines, and structured in such a way that makes them a joy to wear. Etro is no stranger to pattern, most often producing work in varieties of paisley. However this year they have produced a number of items incorporating stripes in such a way that only Veronica Etro can. The Floral Print Shirt in Purple / Multi is a perfect example of how Etro can take a pattern you have seen many times over, and offer a new perspective on its ornamentation. Marni’s aesthetic is most often described as creating an avant-garde lifestyle, or an essence of quirky elegance. This year they have implemented a variety of stripes within their Resort 2019 collection, in vibrant blue and orange combinations, gold and purple hues, as well as navy stripes. Although their Striped Pants in Mazarine are reminiscent of the classic Brenton stripe, there is something about the shape of the pant that makes this print feel reinvigorated.